the life of the party, architect Vincent Van Duysen is a colorful character in the world of Belgian design. His energetic and cheerful demeanor often surprises those who’ve only known him for his minimalist architecture and quiet interiors, which are the epitome of sophisticated European modernism. Located in Wilrijk, a suburb at the southernmost tip of the city of Antwerp, this recently completed residence by Vincent Van Duysen Architects is no exception. While not overly grand, the contemporary home packs a punch with its high-contrast black and cream palette, noteworthy furnishings, and museum-quality art. 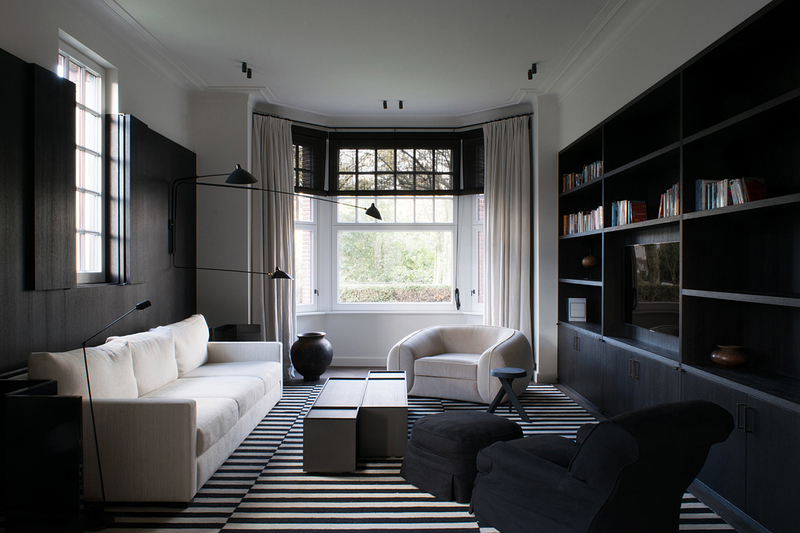 In the tv room, a black and white striped rug (a signature VVD element) ties together dramatic ebony shelving and off-white, oversized furniture. The walls and ceilings are dotted with modern black area lighting, including an iconic three-arm wall lamp by Serge Mouille. the formal sitting room and tv room sits a vintage desk flanked by two Pierre Jeanneret Chandigarh chairs. Beyond, in the sitting room are two of Jeanneret’s Easy Chairs, richly upholstered in dark olive velvet. The space borders on minimalist, but remains warm and inviting. Van Duysen explains the warmth he brings to his projects as a heavy influence he draws from the south, having Mediterranean blood from his mother’s side, a career launched in Italy, and today, spending as much time as possible on the Portuguese coast. Despite juggling his own architectural practice in Antwerp, product design for a long list of international manufacturers, and his role as creative director at Molteni&C, Van Duysen never falters in his unique style of restraint. pop of dusty pink punctuates the space. Above the modern marble fireplace, hangs a work by Italian artist Lucio Fontana from his famed ‘La Fine di Dio’ series of egg-shaped paintings from the 1960s. Rather rare, only 38 of these works exist. Known for being one of the few “starchitects” whose signature style permeates not only his architecture but his interiors as well, Van Duysen has the ability to create spectacular architectural and interior design moments for deserving furnishings and priceless works of art. dining room and powder room the walls and trim are drenched in soft black, creating an intimate cocoon effect that adds intrigue to the space. Noble materials such as Italian marble, smoked oak, and fine Belgian linen, are applied with the highest level of craftsmanship – something Van Duysen is particularly known for. His attention to detail is meticulous, his palette neutral, and his use of ornamentation, sparse. Between Van Duysen’s robust body of work and that of his fellow countrymen, John Pawson and Axel Vervoordt, this zen-like, minimalist aesthetic has come to define contemporary Flemish design.